Comparison of all the modern rifles used in the World War reveals dead uniformity on both sides. Excepting the U. S. Model 1918 Automatic, all were bolt action and followed closely the generalities of the superannuated Mauser. Such a condition reveals a long-continued and very had state of stagnation in arms development. Of course it is axiomatic that had any nation at the beginning of war possessed a radically better weapon and a soldiery who were masters of it the war would have had a quick finish. But mediocrity among widely scattered units passes unnoticed; it is only when all are marshalled for review that mediocrity obtrudes itself. From the review which follows there is but one valuable fact to be learned, and that is a warning: now is the time of change. No. 19 Lee-Enfield, Long Pattern, Mark 1, 1907. Calibre .303 or 7.7 mm. Box magazine holding 10 cartridges in two columns of five each. Length 4 ft, 1| inches. Weight about 9 pounds, 4 ounces. Length of latest sword bayonet 1 foot 5.2 inches. Bullet velocity, latest, about 2,340 f.s. 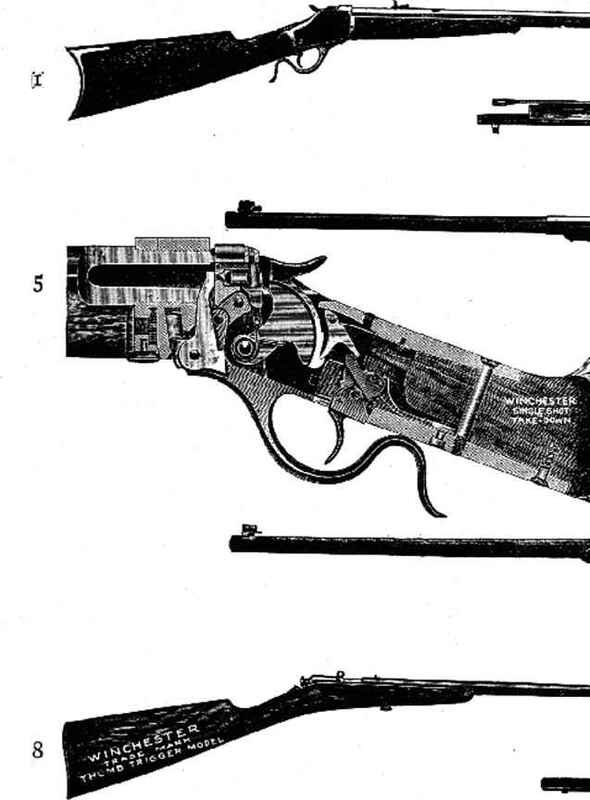 A small pattern of this rifle called the Short Enfield, Mark 111, using the same ammunition, is described under Carbines, although it was equally an infantry arm. These two patterns of rifles were used in the World War by Great Britain and her Colonial troops, except that at the beginning her Canadians used the Ross rifle (see page 267).